My friend work outside Jakarta, he work as a product designer labour in one of major electronic company in Indonesia. The company is quite large but doesn’t mean that u’ll get a great food in lunch. 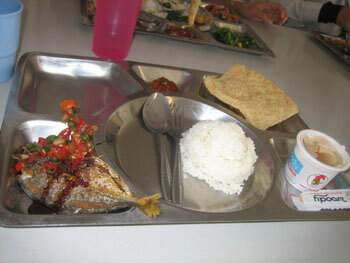 The food was was prepared by the company, so u didn’t have a lot of choices in eating lunch. They get two fried fish(“Ikan Kembung” in Indonesian), one “Kerupuk”, a scoop of rice, a little hot sauce (“Sambel”) and once a month get an ice cream. Sometimes i was happy to see that i have a large variation of food in the place where i was working. Previous Posta hectic day at the officeNext PostMask Man!!! !